The sun, in the few hours when we see it in December, is feeble and low, and the Bering Sea, slushy during November, has begun to freeze hard. Perhaps because of the outside darkness, western Alaskans begin the celebration of Christmas early. You�ll see Christmas trees in homes as early as December first. And so, the KNOM mission �trims� our signal throughout the month with Christmas hymns and songs and special inspirational and educational spots. Thank you for remembering us in your prayers and for providing our work financial support. It is you who make our strong beacon of God�s Love possible throughout this vast cold region. DECK THE HALLS: (left) The KNOM hallway is filled with holiday cards from KNOM friends and supporters. Volunteers Michael Warren and Kelly Brabec post Christmas cards outside Studio B, where most of our inspirational and educational spots are produced. Thank you to all of our friends who help buoy our spirits this time of year! INSPIRATIONAL SPOT: God, grant us the light of Christmas, which is faith, the warmth of Christmas, which is love, and the radiance of Christmas, which is purity. top One thing we can be sure of in Nome, Alaska is a WHITE CHRISTMAS. And a cold one...December has been known to drop below -40 F., although the temperature is usually much warmer, ranging from about -5 to +10. Still?brrr! WHERE THERE�S A WILLOW: A �traditional� Christmas evergreen tree can cost a hundred dollars in Nome, and many families keep the holiday economical by using what Nome has to offer: willow shrubs. Many varieties of willow bushes grow naturally on the tundra, and the branches are plentiful and strong. In Nome�s St. Joseph�s parish, the Little Sisters of Jesus surround the church�s creche with willow branches. The figures of Mary and Joseph and the shepherds are clothed in Alaskan parkas, and instead of sheep and cattle, the manger is surrounded by caribou and moose. �A CHRISTMAS CAROLE� by Charles Dickens, performed by KNOM volunteers in 1973, is among thirty seasonal stories you�ll hear on KNOM this time of year. Other notable performances by the �KNOM Players� include Hans Christian Anderson�s �The Fir Tree,� KNOM-written productions �Christmas on King Island� and the humorous �Not Necessarily the Night Before Christmas,� as well as KNOM dramatizations of �The Fourth Wise Man,� �Stubby Pringle�s Christmas,� and many more. These enjoyable tales help keep the KNOM air signal bright and cheerful as we approach the celebration of Our Lord�s birth. INSPIRATIONAL SPOT: The Christmas manger scene is not just a pretty ornament. The stable in Bethlehem can teach us many, many lessons, if only we are willing to learn. Lessons of humility, simplicity, and most of all, love. top 25 YEARS AGO: December 1974 brought bone-chilling thirty below temperatures, as Nome continued to �mop up� from the devastating November 11th storm that wiped out many homes and businesses. The needles fell off KNOM�s Christmas tree, which had been hard frozen. Back in September before winter closed down the road, the volunteers had cut it from the nearest spruce grove, 59 miles from Nome. INSPIRATIONAL SPOT: Every baby�s birth contains the wonder of God�s creation. Mary�s virgin birth is the simplest, most beautiful and world-changing miracle of all time. WITH SPECIAL SPOTS AND STORIES, Christmas hymns and songs, the Christmas season brings major changes to the KNOM program schedule. 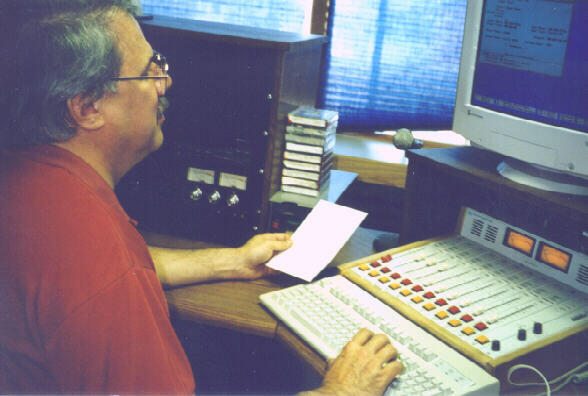 at Catholic station KBVM-FM in Portland, OR before returning to the far north as KNOM program director in 1995. Ric�s wife Lynette, also a former KNOM volunteer, is the station�s inspiration director. You can bet that the couple will enjoy a busy Christmas, with their young children Nick (11), Jenna (10), Tara (9), Sam (6), Tim (4) and Rosa (3). Please consider adding Alaska Radio Mission: Station KNOM to your will. Our address is PO Box 988, Nome, Alaska 99762. 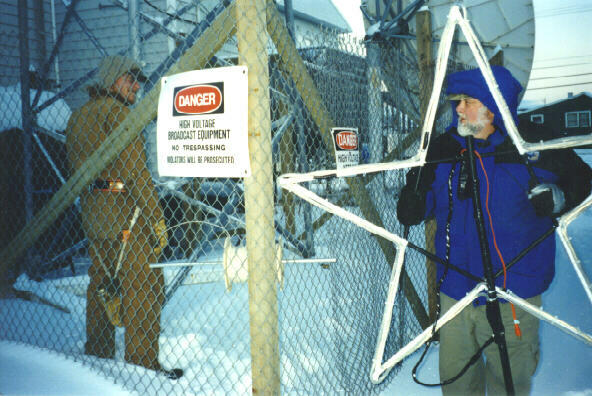 STARRING.... (left) Les Brown hoists the 5-foot KNOM Christmas Star above the tower fence to former KNOM�er John Albers. A star has decorated our downtown studio tower every year since 1971. Three stars have succumbed to Nome�s brutal wind. This one, which Les built in 1996, uses tiny lamps encased in plastic tubes. It shines 88 feet above Nome�s dark streets. VERY SPOTTY: KNOM�s inspirational spots are short recorded messages, like commercials, usually with music or sound effects. We broadcast them to inspire the listener, to bring him or her closer to Christ. KNOM airs about 33,000 inspirational spots every year, as well as 33,000 educational ones. They are an extremely effective way to spread God�s love by radio, as they are heard by thousands of people who would never stay tuned to long-form religious programs. From the KNOM staff to the farthest listener, almost everyone has a story of being especially touched by a KNOM inspirational spot at a time they needed God�s inspiration the most. KNOM broadcasts the Mass, daily Rosary, and sermons and prayers, but the inspirational spots are our programming�s core. KNOM is the oldest Catholic radio station in the United States. Our signal beams God�s love throughout vast western Alaska, 24 hours a day. Our only source of income is the generosity of good people like you. May God bless you for your kindness! INSPIRATIONAL SPOT: Dear God, as the year�s end nears and nights are cold, we think about things that warm us, like quilts and blankets, each one made of many pieces, different colors, sizes and shapes all stitched together to form a thing of service and beauty. Lord, let us not forget that we, too, come in various colors, shapes and sizes, and by Your design, we, too, gain strength and beauty from this variety. Thank you, Lord for all of our differences. top CHRISTMAS MARATHON: For the fourth year in a row, KNOM will host a fun (for the listener) but grueling (for the staff) 7-hour Christmas greeting program. That�s enough time for about four hundred village callers to send live Christmas wishes over our 25,000 Watt signal. The show will leave Tom, and telephone screeners Ric Schmidt, Matt Christy, Michael Warren and Mike Nurse exhausted, but joyful in the knowledge that by means of the program, about 6,000 KNOM listeners will have heard their friends and relatives remember them by name over KNOM. Y2K-OK: Our oldest computer, a 7-year veteran of the newsroom, needed replacement. A few of our computer programs, like the one which controls our transmitter, needed software �patches,� small fixes. As far as we can tell, the KNOM mission is 100% ready for the year 2000. Nonetheless, instead of celebrating on December 31st, we�ll be at work watching over our computers just in case. 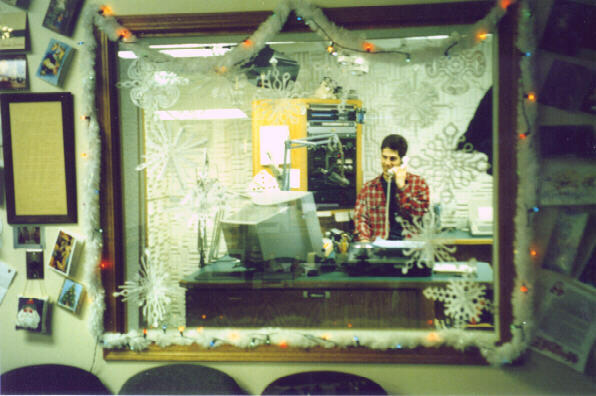 ALL DRESSED UP: (left) Studio A, KNOM�s main air studio, is all decorated for the season, as news director Paul Korchin fields a telephone call. Despite the paper and tinsel and lights, there�s a lot of work done in this snug little room! May you and those you love experience the Peace of Christ this Christmas season, and always. God bless you! INSPIRATIONAL SPOT: Almighty God and Father of Light, a Child is born for us, Your Son is given to us.